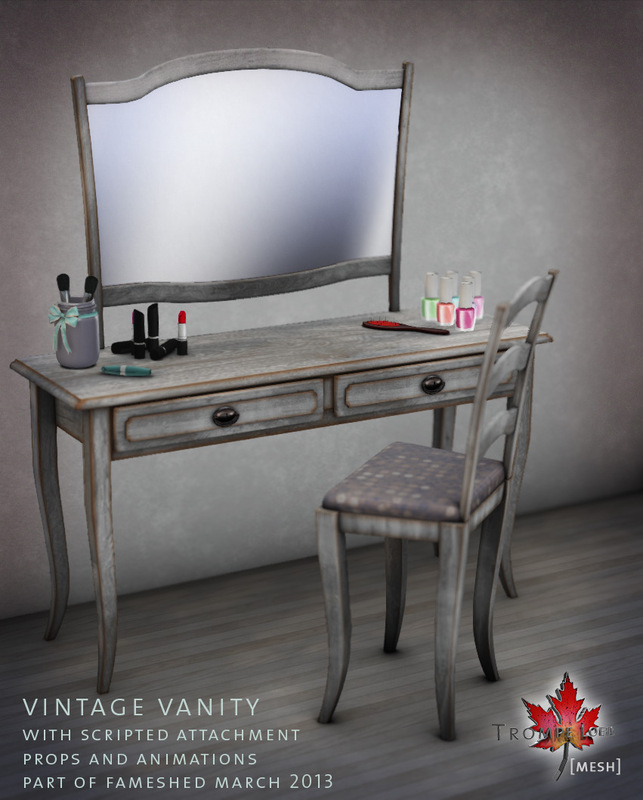 Its almost time for FaMESHed yet again, and there’s a lovely vintage bathroom collection waiting in the wings for you…until then, take a sneak peek at the Vintage Vanity, which includes 7 animated poses including brushing your hair, painting your nails, and putting on mascara, lipstick and blush – and we’ve included the attachment props as well! Get them from the chair’s animation menu or just click the corresponding desktop prop to have the item automatically attach to your avatar. Easy and fun! Stay tuned, we’ll have more to show from the new vintage bathroom set in just over 24 hours!